My life has been graced by many wonderful animals, who have brought me love, and taught me to give, they have filled my heart … and broken it. And yet, when a heart breaks in that way, none of the love leaks out. In fact, it seems that the more cracks there are in a heart broken by loss, the more love can enter and stay. This page will be a work in progress, as I introduce you to our current non-human family members. A Heartbreaking Update: After a short but cruelly aggressive attack by an incredibly invasive cancer, my heart-of-hearts passed away on October 3rd, 2015. He slipped through the veil at home, with his head in my lap and his daddy at his side. Attending him lovingly was his life-long vet, Dr Diane Biederman-Brynda, and her assistants. My world as I have known it is gone. The new world is an alien one, and devoid of a very special light. In his memory, and in my great love for him, I leave his entry, below, intact. It will remain at the top of this page, no matter how many changes may occur in the future. Kai shall always be my soul’s best friend. 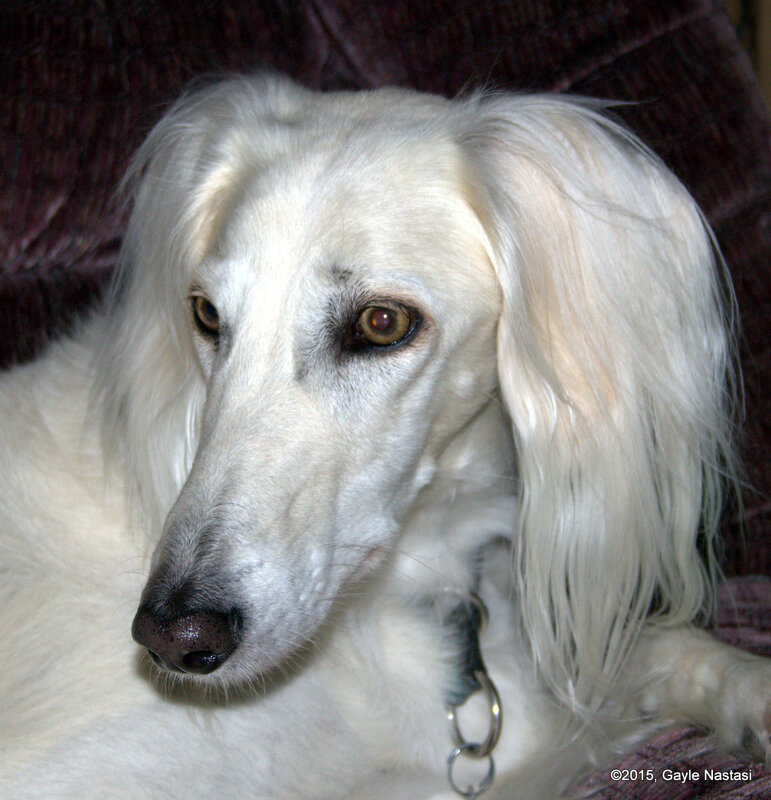 Kai is Amala Ziven Prokyon, a Saluki who entered his current body on July 21st, 2002. “Intense”, his breeder, my dear friend Amy, called him when he was just a wee puppy, and there could not be a more fitting word to describe him. He is strong. He is loyal. He is funny and playful and joyful. He is a nonstop whirlwind of energy. He is so beautiful it makes me ache to watch him. He is my heart. After my first Saluki, Yoda, passed away, I was certain I could never love a dog so deeply again. I was wrong. I knew not then that there would be a Kai. Kai is my constant companion and an inspiration to my world. His story is told in one of the chapters in the reincarnation section of Penelope Smith’s book, Animals in Spirit. If you have a copy of the book, be sure to look him up. Kai will very shortly turn thirteen years old, yet he is just showing signs in the last few months that he is aware he’s older than two. He still runs the fenceline with his equine playmates, goes through a daily attack of the zoomies, plays with the cat, and is hoping that someday soon he will finally catch that blasted squirrel. (Or one of them, anyway.) His mother, Zahrah, so very dear to my heart, lived to the glorious age of sixteen. We are all hoping that Kai will catch (and maybe even pass) her. For decades, one of my dearest friends in the Saluki world was Lin Hawkyard of Lorrequer Salukis. 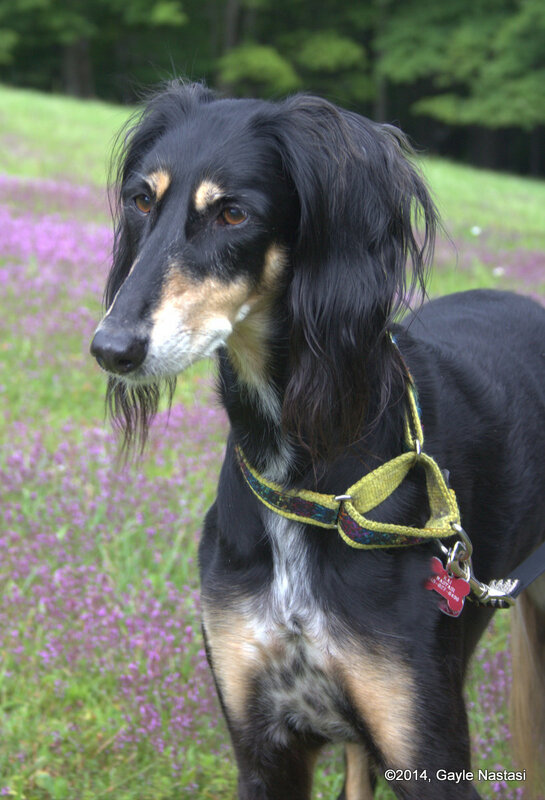 We shared a deep love for this breed, and worked together on auctions and events whenever anyone, dog or human, in the Saluki community had a need. Lin helped me and the group I gathered to form STOLA, we worked together on SIGH, we ran numerous charity auctions, we fought for Saluki health research. Then, three years ago, Lin discovered she had cancer. On December 13th, 2015, Lin’s body grew too frail to hold her tremendous spirit, and she passed through the veil. I was asked to adopt her heart-dog, eight-year-old Ryder. Of course, there was no question that it was the right thing to do. It is a blessing and an honor to welcome him to our family. Ryder is, officially, Can & Am Ch Lorrequer Kharyder. He is a multiple Best-in-Specialty winning dog with numerous Awards of Merit and Select Dog awards under breeder judges in both the U.S. and Canada. He was chosen as Select Dog at our own Saluki National in 2014, and his son Jesse (GCh Freespirits As You Like It) won the National in 2015. Ryder is a very special boy who, in temperament, reminds me very much of my first Saluki, and my first and forever heart-dog, Yoda. Ryder and I already have a strong bond. I have lost the dog of my heart; he has lost the only human mom he’s ever known. We’ve come together to help each other to heal, and I pray that he remains healthy, grows more and more happy, and enjoys being part of our family for a very long time. Sweet, silly, smart and sassy, Missie Misfit (as my dad named her) was born in May of 2008 in our local animal shelter, the Animal Shelter of the Schoharie Valley. After my mom passed away, my dad had another kitty for a while, Monkey. Her photo is on the front cover of my book, Through Their Eyes, in fact. Sadly, Monkey got out one day and never came home. Several different communicators confirmed what I was receiving but did not want to accept — she was not going to be coming home. Some time later, Pop told my daughter he would like her to go for a ride with him. They surprised me that evening with the news that he had put a deposit on a six month old kitten, and was eagerly awaiting to hear if his application was approved. It was, and a few days later, he brought her home to stay. Missie was the laughter in his world for a little over a year, when one day her daddy took out the trash in the middle of a horrible snow storm, and never came home. Missie and I both lost our daddy on the same sad day, and since then, we have lived in Missie’s house. She is our kitty now, and we have a very special bond with her. Missie is lovable and dearly loved. We treasure her so much, even though she is the first cat I have ever owned who has read the part of the “how to be feline” book about finicky eaters. I try to help clients with this problem all the time. Missie, my own cat, keeps me humble. On the 15th of July, 2018, after a brief and fierce battle with an aggressive tumor on her wing, Stars was taken from me. She was the most amazing bird, with the vocabulary of a three year old human child, and the ability to recombine her words to truly communicate in human speech. She had fans all over the world who enjoyed our Stars Stories on Facebook. I cannot believe that, once again, that demon cancer has ripped one of my greatest loves from my life. My Mommy’s Bird, please be Watching Mommy from heaven. I will miss you forever. As with Kai, I leave her original entry below in her honor. My Starlings. They are laughter and joy. They are smart and affectionate. They are funny, clever souls who keep me smiling with their antics and their vocabulary. Yes, I did say vocabulary. 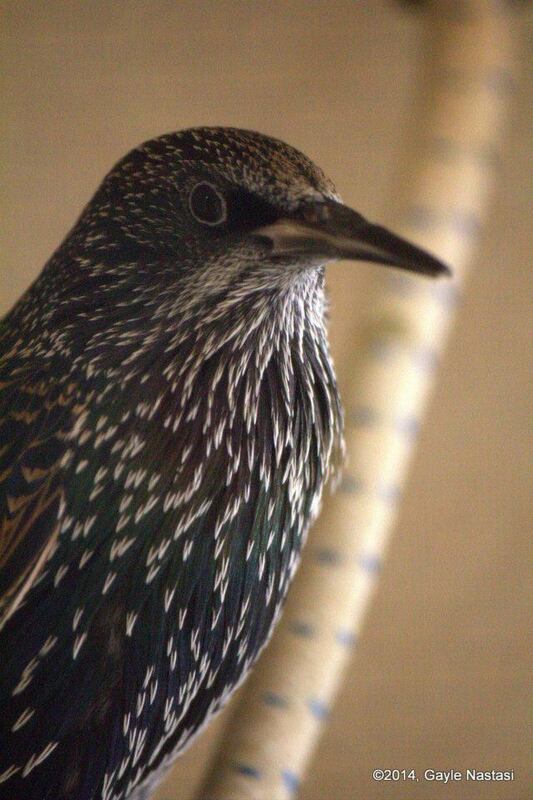 Starlings … talk. They do it very well, too. My girls, Stars and Stripes, were the first birds I raised as a wildlife rehabilitator in 2008. 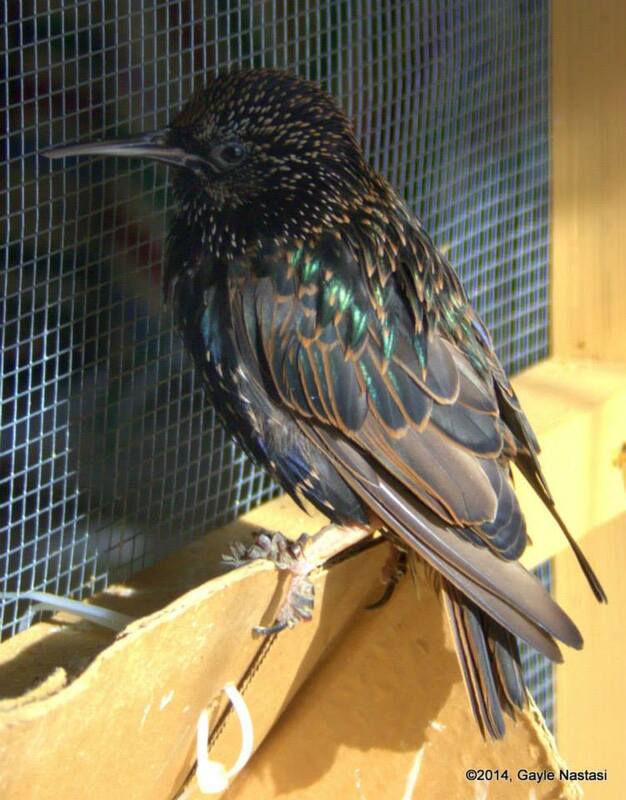 Although I tried to avoid the common problem of imprinting (Starlings human-imprint very easily), I failed miserably. As it turned out, my error was a tremendous blessing, as they are little bright spots in my world. Whistle came along two years later, after we had moved into my dad’s house. He was one of a clutch of six, and even though the others released just fine, Whistle refused to leave. He was alone in the soft-release aviary after the others had flown free, and absolutely terrified, so we brought him back inside. As soon as he was inside, he started to sing, and sing, and sing. The message was pretty clear. He wanted to be a Nastasi. The links below are a few sound-clips of Stars and Stripes talking. Whistle talks, as well; I just haven’t managed to catch him in the act with a recorder yet. Stars:I’m Watching Mommy! (.mp3) Notes: this is a recent recording, and a bit longer. It’s a capture of part of one of Stars’ favorite exchanges, her “I’m watching Mommy” routine. Listen for: “I see to watching Mommy”; “Mommy’s–” (I think it’s “T-V”, but it sort of came out “Twee-Bee” that time, she usually says it a bit more clearly); The kisses and “Kiss Kiss” are Stripes; Stars says a couple of phrases I’m not sure of and then, “Mommy, too”; then, “What’s he doing to Mommy?” (Stripes is mimicking a human cough); she very quietly says “Stars” right after I ask if she’s watching TV, too; and we end with, “I see to Mommy” as Stripes throws us a kiss. My English (aka “House”) Sparrows are two saucy little characters. I always thought they were just weird little sparrows, but my son now works in an area where the species are in abundance, and he assures me that all sparrows are just as strange. They tear up and build caves with paper towels and like to drape them in their water dishes and soak their cages as the water wicks out. French Fry plays tug-of-war with her rope toys. She is a true little diva, who scolds us whenever we are not doing things to her liking (which is often). Tater Tot likes to sit on the floor of his cage and spin around like a whirlwind. It doesn’t seem to make him dizzy, but I confess to teetering a bit after watching him for a while. French Fry arrived in that same first rescue season as Stars and Stripes. She was a naked little nestling, only a few days old, and fell from the rafters of a riding arena. She landed in the sand right in front of a very kind horse, who stopped and refused to move forward until his rider dismounted and picked up the little bird. She took it to the farm owner, who told her to toss it in the manure spreader. Fortunately, the lady had a better heart than that, and gave me a call. 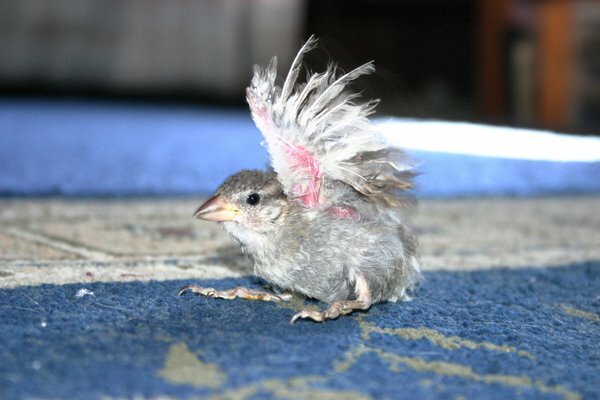 When French Fry’s feathers came in, they were curly and frizzled, and she still has feather problems and cannot fly. As with many of the babies we receive, I am certain that she didn’t just fall out of the nest, but her parents disposed of her to save resources for the ones that would survive. Well, their loss is our gain. She received her name because my daughter, when she was little, used to call the sparrows that begged for scraps in the McDonald’s playground “French Fry Birds”. Tater Tot, being a male of the same species, of course also had to have a spud moniker. He came along in 2010, and his beginning with me was a bit shaky. He had been housed with a bully of a robin, and was rather picked on. He took some extra handling, and as a result became far too tame to safely release. 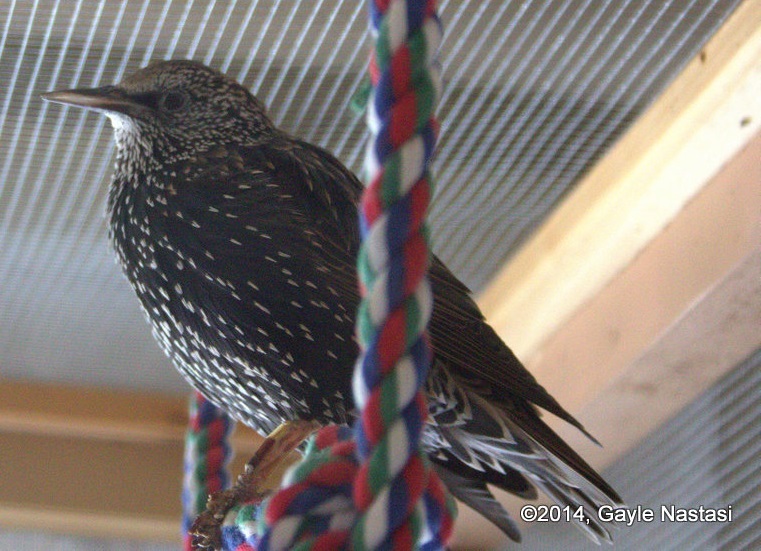 Since wild birds rarely will breed in captivity, I tried housing him with French Fry … once. I won’t make that mistake again, after having to rush to his rescue a few minutes later when she had him on his back by the throat. French Fry does not play well with others. But we adore her, anyway. Update: Sadly, our dear French Fry passed away after a brief but severe respiratory illness, the evening of August 20th, 2015. Fly free, Littlest Birdie. My heart is torn to pieces. You ruled our roost … now, rule the heavens. April 8th, 2019: My little Tater Tot left this earth. I hope he and French Fry have found each other, and that they are friends. I will never forget the date of his death, because it occurred on my 62nd birthday. I will miss his silly antics, the way he’d come flying across the cage for a mealworm, the way he would sit and soak for long stretches in his water dish, and his silly spin-like-a-Tater-Top dance, forever. 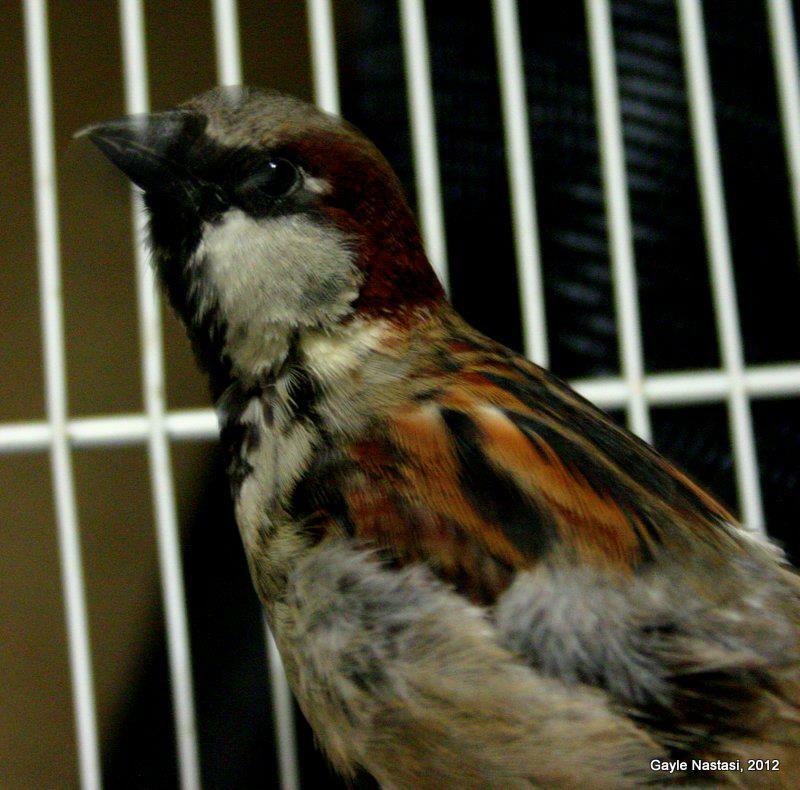 No more sparrows in our home; it’s a significantly darker place. Update: Our family has had just too many losses in the last few months. Frodo was very old, of course, and hamsters just don’t live long enough. On the 4th of December, 2015, my little furry friend did not wake up from sleep. He passed gently and quietly. He will be sincerely and lovingly missed. When I was in college, I had a little roommate named Pippin. 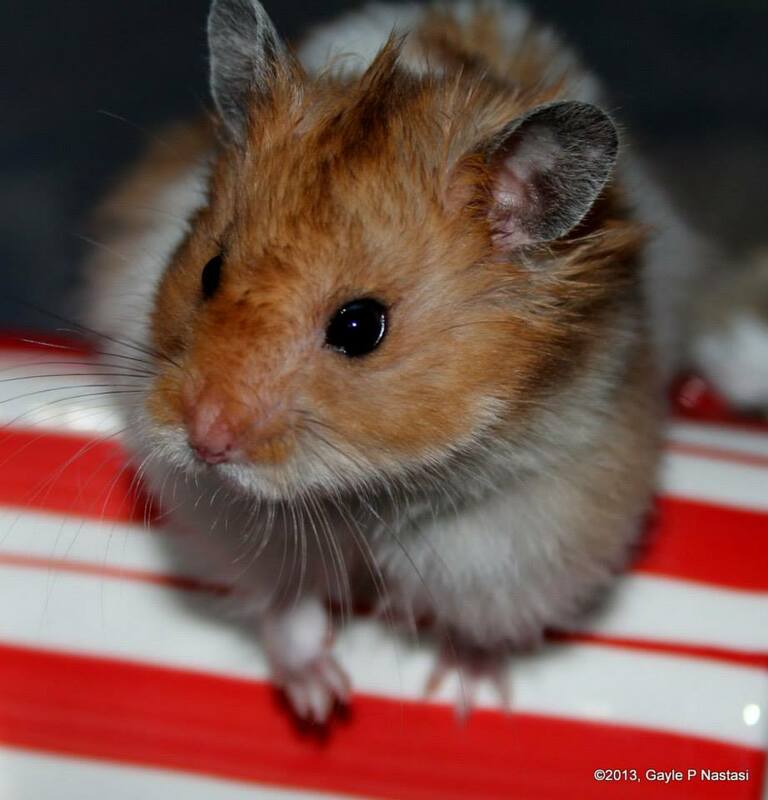 She was a cream banded long-haired Syrian hamster (the kind pet stores often refer to as “teddy bear” hamsters). I’ve had a fondness for hammies for as long as I can remember, and have had a number of them as pets since the original Pippin. It was around my birthday in 2013 that I began to get that old “wish I had a hamster” yearning, and not long afterward, Frodo entered my life. He is adorable, and sweet, though not the most sociable hamster. He’s much more “middle of the night” nocturnal than any I’ve had before, but we respect his preferences, and all love him anyway. Hamsters only have a life span of about two and a half years, so Frodo is technically an old man now. But he is healthy, still loves to run on his wheel (even though it’s usually around two o’clock in the morning when he does so), and is a happy and content little fellow. Horses. I think the first sentence I ever put together back in my toddler days was, “I want a pony”. I was the dictionary definition of the horse crazy kid (times ten). My best friend, Dede, and I would squeal every time we spotted a horse. We went riding together, I took lessons, and my heart still races when I remember screaming on my knees in front of the TV when Secretariat won the Belmont and Triple Crown (his portrait, taken by none other than Dede, hangs on my den wall). I also worked for several establishments where I cared for the horses of others, including a Thoroughbred breeding farm, and was a 4-H member and leader for quite a few years. It wasn’t until I was in my upper fifties, however, that I finally got that pony. 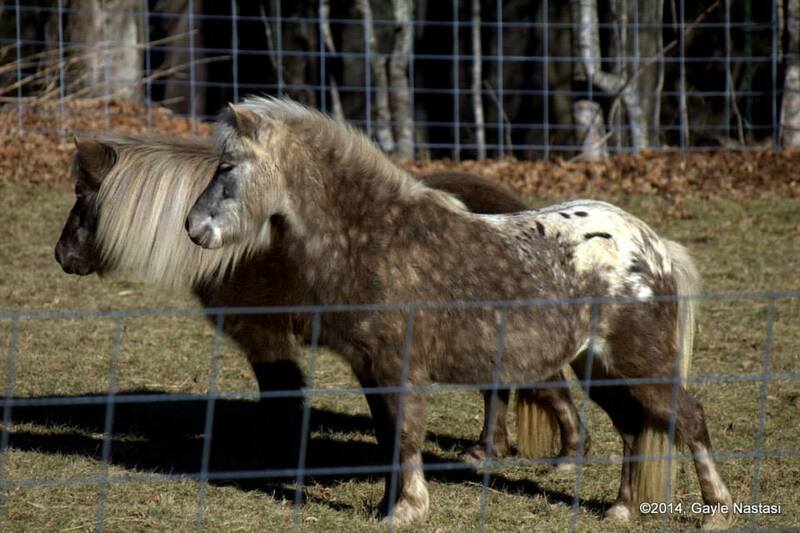 Two, in fact, though technically, they are Miniature Horses. 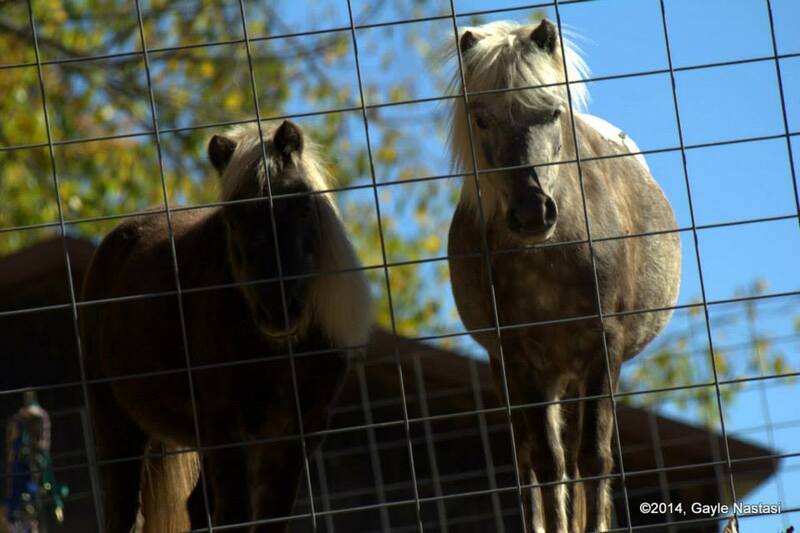 My dear friend, Wes (see the entry on NYWRC on my Our Animal Friends page) came across a situation where all of the animals needed rehoming, and arranged to bring my little mares, Starling and Kestrel, into my life. They moved home in October of 2014, and fill my days with sunshine. Star is a silver dapple mare, and Kestrel a silver dapple appaloosa. They are sweet, friendly, happy little girls. Star and Kes do. Every single time. When I was in high school, my little group of friends and I had guinea pigs (also known as cavies). These delightful animals lived during the school year in Mrs Leslie’s biology classroom, and on weekends and holidays we took turns bringing them home with us. I guess you could say I’m now living my second childhood, as two sweet cavy boars have come to live with us. Pierce is a Teddy (that’s his breed), who turned two at the end of January. He is a retired show p iggy, and has the sweetest, most easy-going temperament. Teddies are a short-coated breed compared to Peruvians or Coronets, but their fur is still longer than the more common American (short-haired) breed. Their coat has a unique, wiry feel, and is scrunchy to touch. Pierce is great fun to pet. Bronny (short for Bron-Yr-Aur, which is Welsh for Hill of Gold) is a young Coronet boar who was born on New Year’s Day of 2016. Coronets have a long coat with a whorl, or “coronet”, in the center of their forehead. His coat is soft and silky, and such a beautiful color. 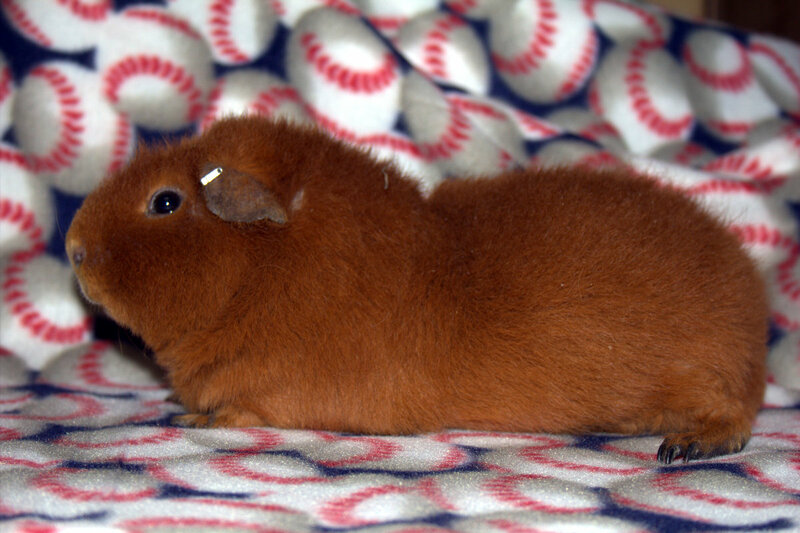 The darker portion of his coat is referred to as “gold agouti”, and he has lovely red patches. 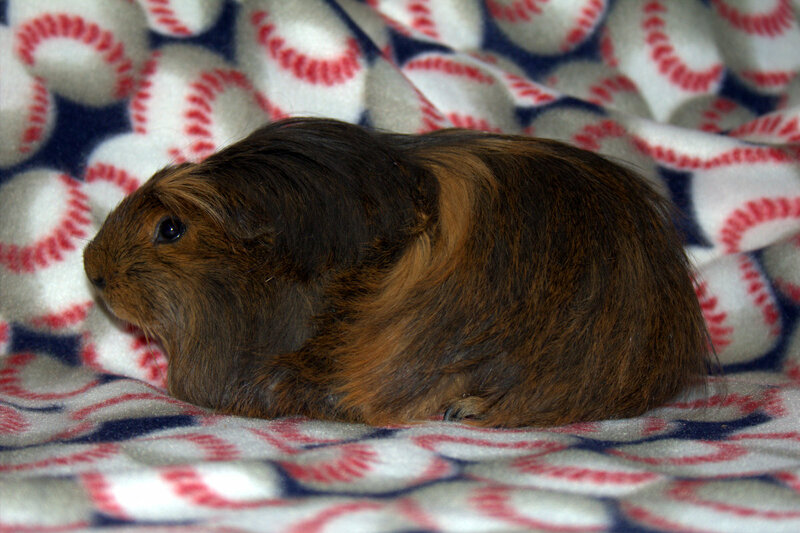 Pierce and Bronny came to us through my friend Penny, of Briarpatch Cavies. In sorrow, I must report that our little old man, Pierce, is no longer with us. 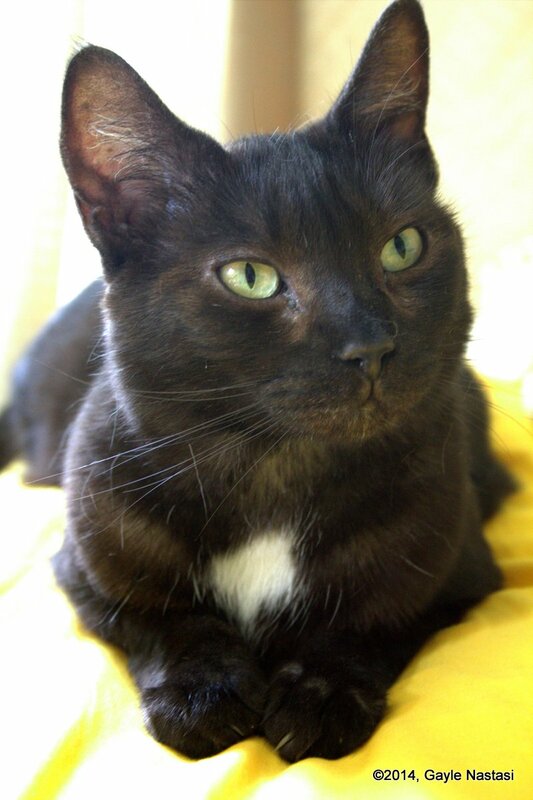 He declined in the late winter of 2019, and passed away at the beginning of February, only a short time after his fifth birthday. He is dearly missed. He was the sweetest boy, gentle and easy-going. I hope there is lots of romaine in piggy-heaven for you, little Pierce. After Pierce’s death, Bronny became very depressed. It is not unheard of for guinea pigs to pine away and quickly die when a lifelong cage mate passes, and my two boys were very bonded. Their breeder, as concerned as I was and always so kind and supportive, offered us a baby to keep Bronny company. Little Elroy (Briarpatch El Rey) is a chocolate tan Teddy, the same breed as Pierce. As soon as he moved in, Bronny’s world lit up again, and he made a complete turn-around. Elroy has been with us for several weeks now, and he and Bronny are joined at the hip. It was such a great relief to see Bronny happy and playing again, when we had grown so worried about him.